At Iroquois, we offer a range of point-of-sale (POS) payment options that let merchants accept credit or debit card payments in the card-present environment. As an industry leader, you can count on us to offer the latest technology, top-of-the-line security, exceptional up-time and outstanding customer support. Let our knowledgeable staff assist you with selecting the right connectivity and point-of-sale equipment to exceed your business requirements. Manage your business from anywhere at any time. Customizable, expandable, and integrates with all the tools you need — Poynt is made for the modern, on-the-go lifestyle. Sleek design meets functionality in an innovational smart terminal that allows you to bring your business to your customers. and the last one you’ll need. Not only do you offer products and services that your customers love, let them make payments in a way they’ll love too. 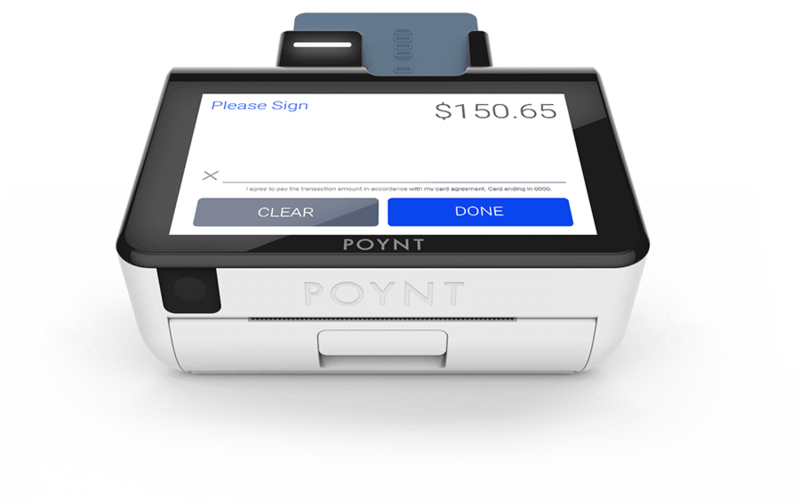 The Poynt Smart Terminal is made for each stage of your business and gives you the freedom to work with the bank of your choice. Talech’s simple and intuitive interface allows for efficient setup. With just a few taps you can take orders, manage inventory, access customer information and view daily reports. Designed especially for small businesses with big aspirations, NCR Silver is a simple yet sophisticated POS.